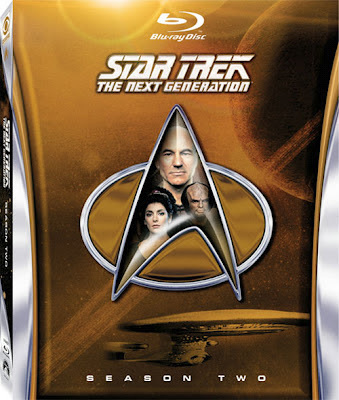 Star Trek: The Next Generation's second season will be released on Blu-Ray on 4 December 2012. Like the first season, the second season has been painstakingly re-mastered for high-definition, with each episode rebuilt from its source film elements from scratch. As a bonus for fans, the set will include a specially-extended cut of the fan-favourite episode The Measure of a Man. A longer cut of the episode was specially prepared back in 1988 for writer Melinda Snodgrass. Snodgrass kept her copy of the extended cut and loaned it back to the remastering team, allowing them to create this extended version of the episode. The set will also include a brand-new roundtable discussion between the original TNG castmembers as they talk about the show twenty-five years on from its launch. CBS has also revealed that the first season sold almost 100,000 copies in its first five days on sale in the USA alone, a highly impressive figure (making back more than half of the money invested in remastering the season) given the high retail price of the set. I recently completed my collection of the fan collectives. Time to start on these!